That "strange old hermit" beyond the Dune Sea finally gets his own issue. So what did he do during all those years? Well he spends this issue confronting a band of thugs working for Jabba the Hutt, who are collecting "water taxes" during a drought on Tattoonie. He also looks after young Luke Skywalker from afar, as his uncle does not want him trained in the Jedi way. But when Luke runs off to get the water back from Jabba's men, Old Ben might have to rely on his Jedi past to save the day. First the good news-this is actually a compelling story, handled well by writer Jason Aaron. 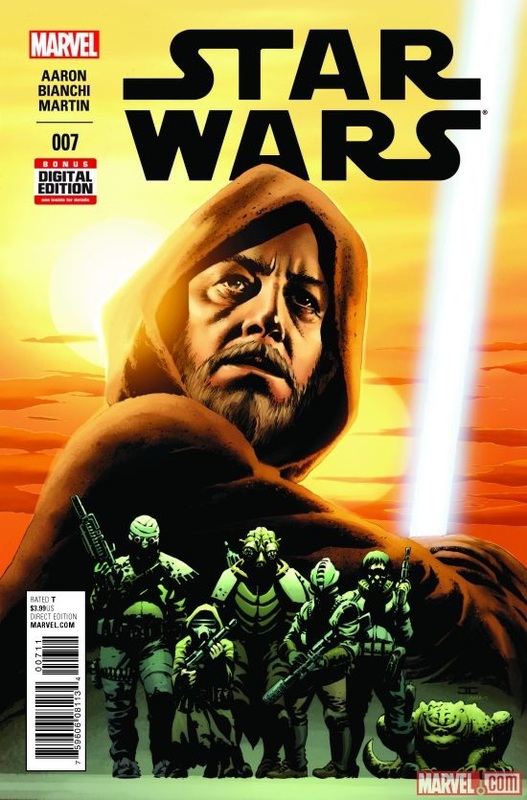 While it is pretty much a stand alone issue, Aaron does a credible job establishing Old Ben as a man having to suppress his past in order to keep Luke safe while at the same time seeing the cruelty and evil that has now begun to take over the universe. It's a look we never saw in any of the previous comics or novels to my knowledge and makes this reader wish this was more than just a one shot story. Art duties here are courtesy of Simone Bianchi, who brings a nice balance to the look of the comics. The designs are nice, capturing the lived-in "used" look from the original movie while serving the story well. The color palette is also handled well, showing off a more subdued look that fits the story being told and the place and characters. Fans of Star Wars and Old Ben Kenobi will find much here to enjoy and maybe it will lead to more stories with him center stage. Next time I'll look at the latest starring "a former pupil" of Obi-Wan's. Until then be safe guys.